A typical weekend for me is either chilling out and relaxing with family or heading out and scouting new places to find good food alongside great company. On this particular weekend, I ended up having lunch with a friend in an old train carriage turned restaurant. Yes, you read that right. Easey's in Collingwood is what your childhood dreams are made of. With three floors of restaurant leading you all the way up to the dining carriage, which literally sits right on top of the building. The views are simply amazing and a perfect backdrop for a weekend lunch in Melbourne. I really hope you have enjoyed this little lookbook I've put together for you, I had such a fun time filming and editing it together and I really wanted it to be both creative and easy to watch. If you would like to see more like this, let me know in the comments down below! Thanks Olivia! I know, how cool is it?! Awww pretty dress and you are looking fabulous in it. You look stunning! The outfit is absolutely perfect, black and denim are the best combination. Thanks lovely! I totally agree, I love the look of black against denim! This sounds like so much fun, nothing is better than going to a cool restaurant with your friends. You look stunning by the way and I love the color and waves of your hair! I love, love, love that pinnafore! It looks great on you! Thanks Rachael, I'm in love with it and wearing it every chance I get! You are killing it with that QUAY sunglasses! And how freaking cool is that restaurant? 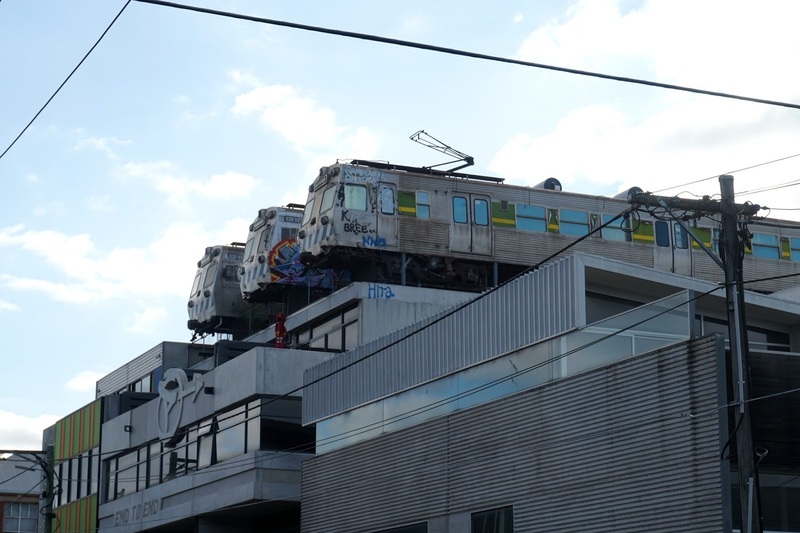 But the biggest question is how the hell they managed to get those trains up there? That restaurant looks SO awesome, what a neat idea! I love your look for the day, the denim dress is fabulous. Aw you are so stylish and pretty! I love that look! Perfect style and super cute sunnies! Thanks Cvetina, you're so sweet!